Kendall Tarte was willing to babysit two kids as long as it gave her the opportunity to move to France after graduating from college. Tarte does not come from a French-speaking family, even though people often mistake her last name for being French. However, she fell in love with everything about the country, its culture, and its language as an English major at the University of Virginia in the 1980s. So when a French couple offered Tarte, then 22, the chance to be an au pair and look after their 3- and 4-year-old kids, she accepted it since the position was based in the southwestern city of Angoulême. The couple also owned a small book store, so Tarte had plenty of books in French to read when she was not busy babysitting full-time. When Tarte was hired at Wake Forest University in 1996, she also thought her stay in Winston-Salem would be brief. 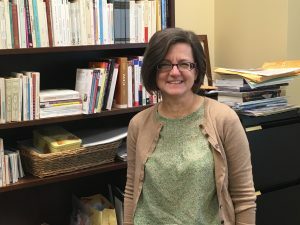 However, she has outworked that initial one-year contract as a French instructor and was appointed Chair of WFU’s French Studies department in 2016. Now an Associate Professor, Tarte has returned to France twice while serving as the faculty director of WFU’s study abroad program in Dijon. Her second edited collection of essays, Itineraries in French Renaissance Literature, was released in November, and she is in the process of writing her second book. Born and raised in Virginia, Tarte studied French throughout high school but thought she would be a Chemistry major in college. However, science didn’t pique her interest as much as sixteenth-century French literature. While taking a graduate class about women writers of the French Renaissance, Tarte became fascinated with Madeleine and Catherine Des Roches, a widow and her adult daughter who wrote poetry in the late 1500s. Tarte wrote a seminar paper about the Des Roches mother-daughter pair. She later expanded her research and published her first book, Writing Places (2007), which examines the sixteenth-century writers who gathered around the Des Roches women in the French city of Poitiers. Tarte’s latest book project explores the ways in which historians, geographers, and visual artists depicted France during the Wars of Religion through their engravings and writings from the 1570s. She received a grant from the National Endowment for the Humanities to assist in the writing of her book. Along the way, Tarte has developed an usual interest in teaching French grammar to her students.